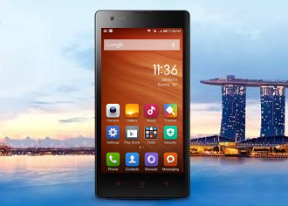 The Xiaomi Redmi 1S features a 4.7" HD IPS display with a pixel density of 312ppi. It's covered by AGC Dragontrail glass for protection against scratches and cracks from pressure. Here is the display matrix of the Xiaomi Redmi 1S shot with our digital microscope. 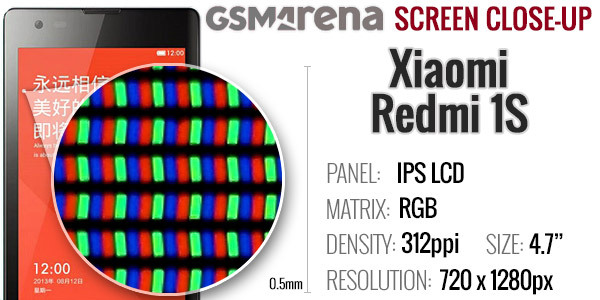 Taking a closer look at it reveals a standard RGB arrangement of the sub-pixels that make up the Xiaomi Redmi 1S LCD panel, not that we've expected anything else. The display on the Xiaomi Redmi 1S is quite bright at 100% with great contrast and colors. Unfortunately dropping the brightness reduces the brightness quite sharply and the screen becomes dim very soon, the 50% setting is actually closer to 25% of the actual brightness. An important note has to be made here - the screen, while employing an excellent panel has a very reflective glass on top, which causes its image quality to degrade rapidly when there are external light sources present. So while it looks great in a pitch black room, it loses a great part of its coolness in even moderately lit environments. The sunlight legibility is also quite poor due to the highly reflective glass. You are going to have a hard time using the Redmi 1S in the bright sunny days. Xiaomi has put a 2,000mAh battery inside the Redmi 1S and it is removable, so you can replace it anytime you want. 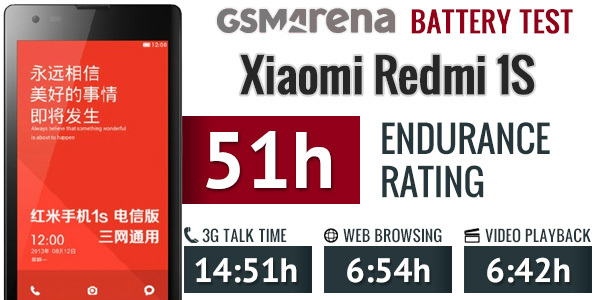 We ran our battery test and the Xiaomi Redmi 1S scored 51 hours, which means you can count on two full days if you do an hour each of calling, web browsing and playing video per day. For a more detailed breakdown of the Xiaomi Redmi 1S battery performance check out our blogpost. LTE is the obvious thing missing here, but that's hardly a frequent occurrence among the phones as affordable as the Xiaomi Redmi 1S. In fact this one has an LTE version, but that's single-SIM only and is only available in China.